Ji Eun has been teaching kayagum for many years to people of diverse backgrounds. She provides one-to-one tuition, group tution and workshop. For the one-to-one tuition, she teaches only at her place in New Malden(close to Wimbledon, London) and the tuition fee is £30 per hour. You don't need to have your own instrument to start with as she provides one for you during the tuition. If you wish to buy your own kayagum, she'll help you to order it from Korea. She also teaches at schools and provides various workshops. 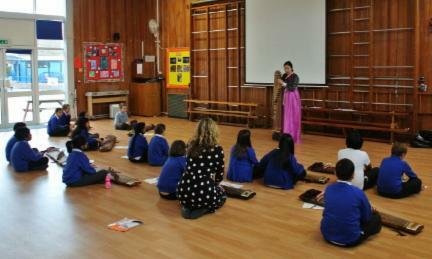 The students can experience Korean traditional music and culture which is very rare to get in UK and Europe.